Thanks so much i already received my car,The car is very nice i appreciate you..
it was great having business with you. We hope you are enjoying your car. Thank you Cardealpage for your cooperation. Looking forward to shopping with you in a near future. Asante. Thank you also for this nice picture with your cute son. Thank You for purchasing from Cardealpage , we hope to see you again soon! Yes i received the car and it was in a very good conditions and would once again thank Cardealpage for that.Refer to Photo attached. I will recommend CDP to any potential future buyers. You accepted to send money even without see the car. We had to purchase it from auction for you. You trusted us and we did the best we could do to purchase the BEST unit for you. it is in very good conditions . Thank you very much for purchasing car from us. we really enjoyed having business with . We do expect many more to come. This serves to confirm that i have received the vehicle.it is in good condition. I would like to thank Cardealpage and whoever concerned for your proffessional involvement to make this deal materialize. I will positevely recommend Cardealpage to any future buyers. Thank you very much for your complement. I am looking forward for future cooperation. Thank you for nice car. We really appreciated each moment doing business with you. I received my car safely. Thank you. Please receive the car photo already registered with my son in front. It is a good car and what I wanted. Thank you very much for the feedback and for the photo. We are very happy that you received the vehicle in VERY GOOD condition and that you love it. It was a pleasure doing business with you, we really enjoyed each moment talking to you. I have received my car since January 24th.it was in a good condition. This is my 4th car if I am not mistaken that I bought from you.I always advice my friends and family to purchase from you.because I trust you. We are so happy to hear that you received your vehicle in good condition. It was a pleasure having business with and we do expect more business in the future. Hi Thida, thanks you for you good services relation and honest with your team from Cardealpage. Thank you my brother for your kind words. It has been an honor and pleasure working with you. 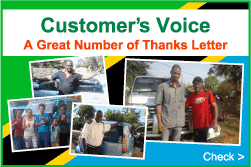 We are glad to hear that you are pleased with our service and condition of the vehicle. Thank you too my dear. Your service is very nice madam. I like it. The buses they are in good condition and my customers they are happy for its. I appreciate your service madam. Thank you my brother. Thanks for sharing nice photos. You all are smiling and look happy. It made me happy too. It was our pleasure to give you service. Hope those buses will also give you a good service in a long run. We are looking forward to do more business with you. Hallow! Hope is all good. Thank you very much I have received my car in very good condition as specified. Thank you for your beautiful photo. I am very glad to see you and your son are happy with the car! I have already received my car in very excellent condition more than I expected.Thanx again for good services specially for keeping me updated for each and every step from the enquiry on the car up to delivery of the same to the destination point which is Dar es salaam Tanzania. Am looking forward to make another business with you. Am currently out of Dar es salaam,I will send you photo with my car once am back. Thanx again and have a gudday. Thank you for your purchasing from CardealPage. I am glad to hear you received the car in good condition. Let’s do business again in the future. I can confirm the vehicle has reached me safely and in a very good condition as previously seen in the photos. The experience has been great and very comfortable. I really appreciate your honest and professionalism. It's very good to hear that you receive your vehicle without any problems. We do hope that you will enjoy driving it for long. Please let me know if you would like to buy a car from Japan again. Will do my best to support supplying the best car. I am still the owner and I drive one myself, and the other one I put a driver. Both are running around Dar es Salaam! Thank you very much for sending photo and message. We are very happy from you that buses that we supplied are running in the Dar es Salaam city. We do hope that it works for long and makes Tanzanian people more convenient to go around. Looking forward to having lots of opportunities that we supply cars and buns for your country. Your Nissan Civilian bus is working as public bus. All are gud. Thank you very much! We are very happy that the bus that we supplied is working as public bus in your country. Looking forward to have lots of opportunities that we supply cars and buns for your country. I now have received the vehicle, much appreciate and many thanks . As you can see the picture that's me and my family looking very happy and i am looking forward to continue on this trade . and to let you know the vehicle have arrive and it is in good conditions no harm done or anything wrong with the vehicle. looking forward to get more vehicle and to continue on our working together. Thank you very much for sharing your photos and updates. Please contact us anytime, we promise you that we always supply quality used cars. Please note that the car mentioned was received on 02/05/2016 in good condition in Tanzania. The car was driven to Kahama where the owner leaves it is about 700 kms from Dar es salam. It arrived safely there as it looks on the attached picture me as a purchaser not the owner. Thank you very much for your kind notification. I am very happy to hear that you liked our service and quality of our cars. I hope we will be able to do more & more business in the future. The car has arrived safely and in good condition.It was a pleasure doing business with you.I have attached a pic of my wife with the car. Thank you very much for nice photos and message. We hope you and your wife enjoy car life. I am looking forward to doing business with you again. Thank you very much Mr Satodshi and your team to remember me. I am doing well. It's very exciting to hear from you that you are still value me for more communication. First of all I thank you for encouraging me even when I went astray to give up the deal with you yet you helped me much to show another alternative till when I got what I dreamed. The car is good it came to me as it was seen on your web site. Real I enjoyed it when I took it from Dar Es Salaam port to Moshi town the distance about 600 km. It was nice . Some people tried to ask if possible I may sell it to them as they admired to get the nice car like that. I hope this is just the beginning but we shall make more business with your company.I had bought several cars in different companies but yours differ greatly from others. You have wonderful communication in every stage. You have wonderful negotiations which is very impressive but also you are very considerate. Here is attached photos of the car even though they are not very attractive as there some light exposure but you will be able to see me. I have never heard your company before any where I found it through internet and sometimes I hesitated to go on with the business only because your company was very strange to me as we feared fake companies. Thank you very much for your kind message and the photo. It’s my pleasure to hear that you have received your car safely and liked it. We always inspect all parts of the vehicle when we purchase, and before shipment, to supply good condition cars to our customers. I hope the car will serve you long time, and look forward to do business with you again. I got my vehicle yesterday. It's in excellent condition. I have liked it alot. Thanks for choosing a good car. The engine and inside condition is perfect. I am very happy to hear your voice of happiness. It is always my pleasure to be in touch with you and to do business with you. Let`s keep in touch regularly. Thank you for purchasing and choosing Wild Goose Japan. We hope you enjoy car life. We look forward to serving you again. am very much ready to work with you in promoting your business in Africa nad beyond i have a 20yrs experience in automobile business both in america and south africa i recently bought a Benz from you guys and 12 of my friends like and want tyhe same car, lets do business sir. We are very happy to have a look at your photo for your Mercedes and you. We trust your 20 years experience in automobile business. Look forward to making more business with you! thank you very much,i have received my bus and its in excellent condition. am so so happy for it and for the company. all of my buses from you are still runing and in good condition. Thank you very much for your photo, I am glad to hear that you are happy with your bus and with our company. I am sure that your Civilian will be very useful for your business. Please keep in touch and let us know if you need any other vehicle. This is is Mr. R N K from Dar es Salaam ,Tanzania. I really really appreciate I got my Car in good condition thank guys so much. You look very elegant standing next to your Minicab Truck. you or any of your friends need a vehicle. kathy hope you hard a nice weekend dear. i would like to thank you so much kathy for a beautiful car you send me its such a beautiful and in great condition . i have the car and all the paperwork has been done am driving the car as we speak.. i will post the photos soon. thank you and car deal group for a well done job. hope you will visit soon and drive in Tanzania. i also wish to be your new cardeal contact Tanzanian. i have very many bussines friends and government officials in tanzania, kenya,rwanda, uganda who will need this type of cars. so lets do business. much love to you kathy god bless. We are very happy to hear that you have relieved the vehicle in good condtion. Do hope to enjoy driving your Mercedes for a long time! Look forward to making business soon. Thanx for your honest and Cardealpage team in general.I got my Allion in good condition as I expected. I would like to advice all Tanzanian and the rest of the world to buy car from Cardealpage website.They are honest in communication and their vehicles are almost new ones.Look on pictures and see how happy my kids are after looking their new ride with full Tanzania registration number. They brought large smiles on everyone working in my office! I couldn’t help but show them off to everyone! Are these really your children? They are so cute, it’s unbelievable! Thank you so much also for your kind words about our service and the quality of the vehicle. We need more customers like you! Have a safe drive, and all the very best to you and your beautiful family! I am very grateful to you for the honest transaction till the deliverance of my MAZDA BONGO It got clearance on 10/ April /2015 and I drove it from Dar es lalam 500 km to my home place without any disturbance. It is the first model to be in our area and everybody who see it admires. It now on the street and today got a first job after business clearance yesterday! I am happy with it ! Powerful and fancy truck. Soon people will be asking me to order for them and will recommend you positively. Thank you very much for this! I must say we've never had any customers take their photos for us with such a beautiful background! We will be sure to come visit you and your beautiful home in our next visit to Tanzania. In the meantime have a safe drive, and all the very best wishes to you and your family! Thank you very much for the nice pictures !! You look great together with the car! Please enjoy to ride this car ! Koudou, I successfully received the vehicle, this time I had no any fear as it was the third car from the same dealer, I knew even the quality will be the same as I saw the unit. It is nice car I like, I thank cardealpage for their friendly support, team please keep it up. Thank you so very much for taking the trouble to send us your photos again. We really are truly grateful for your continued custom and photos, and will make sure that you continue to get the best deals and service possible. Please come back to us when you’re ready for your next vehicle. I promise you once again that you will get a very good vehicle, deal and service all over again! Greatings to you all, I'm very happy for supplying me a vehicle at excellent running condition, I kept quite for some months so that I can observe some the real condition of a vehicle,I always drove it to remote areas with rough roads but still good and working at excellent rank. 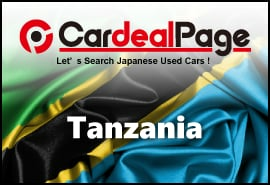 Thank you cardealpage and mr yunus for your good service to customers and that I will recommend cardealpage to other people in Tanzania.my name is Emanuel samandito buyenze from dodoma tanzania. I am very happy to hear that you are enjoying your car. Please keep in touch and hope to serve you again in near future. Thank you so much for the wonderful photos! They're amazing! We're of course so happy that you're so thrilled with the Kluger. We take customer satisfaction very seriously, and it makes our jobs that much more worthwhile in knowing that we have another very happy customer on our side. Please let me know if you need anything us from us. We would love to continue to provide you and your families/friends with great vehicles! First of all I would like to apologize for delaying in responding towards the reception of the car. My appreciations to CardealPageTeam for the good things they have done to me. What I can say is; my dreams have come true after knowing CardealPage Team. "IT'S SURE A PAGE THAT DEALS WITH RELIABLE CARS". Am enjoying driving my car from CardealPage as it is in excellent condition; Am sure my car will last long as it is almost new. I urge customers who need cars all over the world to buy cars from CardealPage because they are reliable, fast and informative to customers on every action/movement they do to make sure their customers are happy. I would like to thank the Cardealpage Team, for your support and commitment to ensure that I got what I have been dreaming of. It was another new experience buying two cars from the company I never had business relationship with but all the cars arrived safely and running great. Team Please keep it up. Thank you so much for your beautiful photos! We are especially grateful for the fact that you have gone to the trouble of sending us photos of not just for one vehicle, but for two vehicles. We are of course also very happy to hear that they are both running smoothly, and you have not had a single bit of problem with either of them. Please let me know if you decide to import more vehicles from Japan. We will provide you with the same quality of vehicles as well as customer support. Thank you from everyone from CardealPage! I am in Dar picking my toy as soon as am settled Will send you photos beside my beautiful and shining Harrier. Very happy and will recommend your company to my funs. Thank you very much for sending us your photos. You look great with the car, I agree that your Harrier is beautiful and shining. I am looking forward to hearing from you and from you funs. How are you? I have received the car, Toyota Mark 2 with Ref. 01515 in good order as you promised me! The car has got no any mechanical problem, it is really in good order and every body who comes across to see my car appreciates and willing to order from Cardealpage.I promise you to proceed doing business with you in future. I think those who ever purchased the car from Cardealpage are very much interested to do business with you in near future. Thanks very much Mr. Yunus also extending thanks to the Cardealpage team. Thank you very much for your e-mail, photo and kind words. I am very happy that you received your car in excellent condition and enjoying it with your family. I can see from the photos that your kids are also happy. We are confident that you will drive this unit without any problem for a long time. Please keep in touch and let me know if any of your friends, relatives or family members want to purchase a car from CardealPage. I am very thankful for your superior services extended to me. I have received my vehicle three weeks ago and it is in a very good condition and works good. Expecting to do more business with your company and most definite you will continue be my preferred dealer for Japanese used vehicles. Be blessed and all the best in your endeavours. Thank you so much! I agree the Canter looks great, and you look great with it too! Please let me know if you ever you need any more units from us. We will definitely give you a good discount for going to the trouble of sending us your photos. Sorry for the late response, but i just received My Car(Passo,Green Silver) like two weeks ago. Me and My family are very happy and pleased because it's in good condition just like you promised. I hope will always be in touch and that way do more business in the future. Please kindly find the attachment of pictures i sent. Thank you very much for your photos and sincere wishes. I am sure your car will serve for a long time without any fail or problem. Let`s keep in touch and feel free to consult me if you need any support from Japan. Patience,I can't speak Engrish I Swahili. Thank you so much for your wonderful comment and photo. I agree that the vehicle looks great, and am delighted that it will be put to very good use on your side. Thank you again, and we look forward to a prosperous business relationship! This is to confirm to have received the Escudo in good order. It now duly registered in Tanzania ino of Mashaka Selemani Chambo. Seen in the attachment is the vehicle with its new registration number parked at Mr. Chambo's residence at Kisarawe. I extend my sincerest gratitude for making this not only possible, but also professionally flawless. Thank you very much. Can you please check the availability of the Escudo's steering hydraulic pump and what it would cost. We may need to change this pretty soon. I’d like to extend our sincerest thanks for your kind feedback as well as taking time to send us the photo. The vehicle indeed looks great and we’re very happy to be able to add you to our long list of highly satisfied customers. Please come back to us before too long. We’d love to supply you another unit! Greetings from Tanzania. Thank you for your service. Your Company is a reliable one. The car I received is functioning well. I will continue doing business with you and invite other friends to enjoy your services. I will send my picture with my newly car from Cardeal page. Thank you. Thank you very much for your kind photos and your warm words. I am very happy that you received your car in excellent condition and you are happy with it. Please keep in touch with me, I hope to do business with you in the future too. I hope you are doing okey. I’m glad to inform you that I received the car (Toyota RAV4) in perfect condition. I appreciate your service from the beginning of the business deal to the end. Attached herein find some photos i have taken. Consider me as your potential customer in future. Thank you very much for your warm words and beautiful photos. I really appreciate your time and attention to this. We are confident that we will be in touch with you for future business too. Please let me know whenever you need our support. Thanks for the e-mail. I wish to confirm that I have received my truck in a very good condition and hope to do business with you once again soon. See attached pictures. Thank you very much for your sincere words. We are very glad to hear that you liked your car. I can assure you that you will be happy with it for a long time. Please let us know if you need any other unit in the future. Thank you very much for the photos again. Thank you very much to your Company T-Shirt and pen, i have received it safely. Please open here is an attachment of our picture with my friend Mr Kakaku. Thank you very much for your e-mail and excellent photo. I really appreciate your time and attention to our request. I am very hopeful that we will do more business together. Let me know if you want to purchase any other unit again. I sent you my picture through my IPad using another email address. Because i did lose the website you sent me. As you promised the vehicle is in excellent condition . Thanks for being honest. My family are loving the vehicle . I am very happy to receive your photo with your car and T-Shirt. Hope your car will serve you for a long time. Please let me know if you need any other unit in the future? I'm verry heppy to tel you that i receive the RAV4 in good condition. Thank you very much for your e-mail and attached photos. I am happy to hear that you liked your car very much. Hope our good business relations will continue forever. I've got the car, I'm very pleased and the car is in good conditions and without problem and in fourth months I`ll buy another car, you're serious that illustrate in pictures and the real thing are not liars. Please receive here below is my picture with my car. Thank you very much for sending us the picture, it will help us in persuading our future customers to purchase a car from us without any worries! We will make sure you receive your T-shirt as promised. Thank you again for purchasing from us, and please don’t forget to continue to check www.cardealpage.com! Thanks for your new welcome to have another choice of a car especially for me. I hope we will make the business in near future. Obtain the the photo of my vicinity with my car aside. I hope we will be communicating later. Thank you very much for your e-mail and beautiful photo with your dream car. I am very happy to hear that you received your car in excellent condition. Hope to do more business with you in the future. Thank you very much for just remind me what to say after a bit time since we communicate. I thank again to receive my vehicle. Its ok, good, perfect and is like what I saw in the web site. Your the best guy in this world of Japan used cars seller last not the least you guy big up by satisfying customers over the world. I received the car on March 31st, 2014 around 5:00 PM Tanzania local time and the car arrived on March 28 ,2014. Thank you very much am very happy with it. Thank you very much for your e-mail and warmest words I have ever heard. I am sure our business relations will continue for a long time. Please let me know if you need my assistance in the future. I will be happy to help you. Thank you for your email. I also like to thank your company for being trustful and hospitality by the time of transactions until I received my car in very good condition. Actually there is no any disturbance,no delays and sell sell at good prices.Thus,I advise ,encourage and ensure all customers to purchase vehicles from car deal page because their trust , no loss of customer's money and their cars are in very good condition and they deliver in time. Thank you very much again for your photos. We really appreciate your cooperation with us. And hope our friendship will continue in the future. How are you doing. Hope you do fine. Thank you very much for your beautiful photos of the bus. We are happy to hear that you received your bus in good condition and it is serving you well. Please let us know if you need any other units in the future. Hi, Mr Yunus. I inform you that I have received my car yesterday .The car is in good condition. I am sending you my photo with it. My friend is also trying to buy from CardealPage now. You are in touch with him already. Thank you very much for your beautiful photo with your dream car. We are happy to hear that you received it in good condition. I am in touch with your colleague Mr. Michael. I thank again to receive my vehicle. Its ok, good, and is like what I saw in the web site. But because now am out of my place I cannot take the picture with car. I will send it when am back. Thank you very much for your message and updates. We are very happy to hear that you received the car in good condition. We hope it will make your family happy for a long time. We will be waiting for your photos with the car. Good Luck to you on the roads. Thank you very much for your whole support and your team received well my car at a very good condition. Trust me cardealpage is the best car deal website around the global doing open and fast shipment to my home country much appreciated looking forward for the future business with me I wel come you in tanzania Asante sana. Thank you very much for your positive opinion and inviting to Tanzania. We will definitely visit you soon. The car looks happy to be with your family. Please be constant visitor of our CardealPage and recommend to your friends. I received the vehicle on the 12th of February 2014 after it had arrived on 9th of February 2014. The vehicle looked better and different from the pictures on your web but it is the same vehicle. I had a wonderful drive from Tanzania to Zimbabwe which was 2600km journey. The engine sounds new and its power is excellent, the interior is spendid and fuel consumption was 1l to 10km. Thank you very much for your feedback and positive news about your car. We are confident that your car will serve you well for a long time. Please send me photos with your car as we agreed. We are desperately waiting for your photos and we hope to do more and more business with you. I received the car first week of this month. The car is in good condition. Thank you very much for honoring your promise to deliver the vehicle without fail. I look forward to doing business with you in future if opportunity arises. I’d like to express my sincerest thanks for trusting my words when you made the payment for this PRADO. I understand that it took a huge leap of trust on your part to send a large sum of money to a company that you’ve never dealt with before. Thank you so much once again, and we look forward hearing from you soon. I happy to inform you that we have received the vihicle today in good condition, thank you very much. The car is very and Mr Athanas, who is the buyer is very happy indeed. Thank you so much for your warm words about our service and our vehicle. We very much appreciate the effort you have made to get the picture to us, and it will help our future customers feel comfortable in knowing that we are a good, trustworthy and legitimate business. Please let me know if you need any more vehicles. We will make sure that you get a fantastic deal all over again. Thank you so much for your feedback Martin! We are absolutely thrilled that you are very happy with your new Harrier. Please let us know if you need any more help from us. We will be delighted to hear back from you. Enjoy your drive in the meantime! Thank you so much for your feedback! We are absolutely delighted that you were pleased with our service, and that your CIVILIAN continues to work without any problems to this day. Please let us know if there is anything else we can do for you. We would only be too happy to help. Thank you again, and we look forward hearing again from you soon. Firstly: I am proud to do business with you and am so glad and i appriciate your business sir. Secondly: I want to inform you that i have already receive one unit, it is very nice as i had expect, whatever it costs me because of the back chair that remove the meaning of van, and the other one could be received after a week. Thirdly: I countinue to receive the phone from so many people addressed from you about your company, dont worry my friend i campain people to buy the cars from you because of your trust, and i plan to take a photo of i weared your T-shirt and send to you. Lastly: i wish you a wounderfull day and nice job inshaallah. I am very happy to hear that you received your vehicle in very good condition. We are proud of having a customer like you and I can tell you seriously that it was our luck to do business with you. I am very hopeful that inshaallah we will continue doing business with you and your friends in the future. I want to thank you separately for your recommending our company CardealPage to the customers. Good luck to you on the roads! I am very sorry for late reply! However, my vehicle is going on well !! I would also like to inform my fellow importers of vehicles to use Cardeal page website because they pride a very good quality cars. Not only that but also updating on every step from day of payment. No pressure about your money. By using cardeal page no need of paying car view charges as they are very trustful. I thank MR Yunus for the good vehicle he sold to me-I real enjoy it. Thank you for your warm words about our company and our service. We are glad to hear that you are happy with your car. Now, we can consider our mission as completed. Wishing you all the best on the roads and safe drive for a long-long time. Please let us know if you or your family members - friends need any other unit. We will do our best again! I acknowledge that I have received my car on time and in good condition. I consider to be working with you in future and further recommend your company to other people interested in importing vehicles from Japan. Thank you so much for taking time to take the picture and sending it to us. We are so grateful at CardealPage, and will make sure that you get a very competitive deal as well as a first-class service all over again should you wish to purchase another vehicle from us. Thank you again for your custom as well as your picture, and we are very much looking forward to helping you with your next vehicle. Thank you for keeping me in touch. I am thankful to have received the car as it was shown in the picture and all other descriptions were unchanged/the same. I enjoyed timely communication during the purchase and it arrived in my country at the earliest time possible. Cardeal will be my page when I think buying another car. Thank you for your feedback. I am glad to hear that you have received your Atlas. It was nice to communicate with you via phone during the business. I hope your Atlas is working for you well in your job. We will be waiting for your next visit to CardealPage. Thank you very much Yunus for your good services. I am a very happy owner of the car. You are fast in replying message,also you have a good service,for sure you have done good job. I will buy again from you because i like your services. Yes, you and your wife indeed look happy with your Prado. We appreciate the photos you sent to us. We know constant communication is very important to our customers as purchasing a car is a big decision for them. So we are delightful that you have rated our communication well. I will look forward to your next visit to CardealPage! I would like to thank you for all your support and shipment of my Opa car to upcountry of Tanzania On time,I real appreciate cardealpage team. I received well my opa and in very good condition my daughter now happy and will easily reach school in a comfortable car. My wife and I ,we thank you very much and soon will do bussiness.I have informed my friends about cardealpage sold used car for a affordable price,that why now are getting a lot of email & order from Tanzania. Thank you for your photos. They made my day. It was our pleasure to provide you our service to purchase your Opa this time. We are glad to hear that it helps your daughter to go to a school more comfortably. It is much appreciated that you have introduced our service to other people. Yes, we will looking forward to doing business with you near future. The car is very beautiful, i am on leave and i have travel to my home town with the new car it is running very good. Thank you for purchasing the Nissan X-trail from us. We are glad to hear that you found it beautiful and it is running well. We hope you had a wonderful road trip to your hometown. Our company cares much to provide our customers good quality cars. We are confident the car will keep serving you good. I have received Toyota Coaster bus in good condition and I am happy the unit condition was as expected. Thanks so much for being proffessional used car dealers in Japan. We are glad to know you are satisfied with the condition of the Toyota Coaster. Our desire is to sell good quality cars to as many as customers possible. We hope the Coaster will give you a comfortable ride on the street of Tanzania. It was our pleasure to do business with you!! I wish to inform you that I have already received the Toyota Hiace commuter in good condition. Please find the attached photos. Thank you for sending us the photos. We are glad to hear the condition of the Hiace Commuter is good. The fast service is also what we offer to our customers. We appreciate to your work as our sales support representative in Dar es Salaam. You are of a great help to CardealPage. I appreciate CardealPage.com for the good services and timely updating during my procurement procedures. Thank you for using our service. I am glad to see your Canter and yourself in the photo. The constant communication is what we value a lot. We do not want to give our customers any concerns due to the delay of any communication. We really appreciate to your work as our sales support agents in Kigoma, Tanzania. I am ever working hard to serve our customers today. We hope you are doing great as well. Your CR-V went through the careful process of inspections and maintenances to assure the good condition. It is our company policy to maintain an excellent quality of our cars. 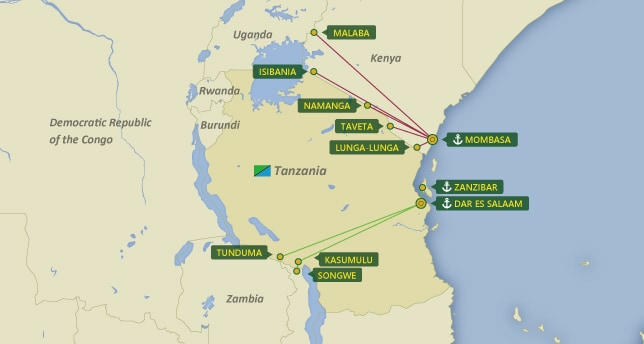 Delivery to KASUMULU & TUNDUMA are included Customs Clearance Fee.The rate for Tanzania includes VAT charge. In case of delivery to ISIBANIA, LUNGA LUNGA, NAMANGA, TAVETA & MALABA via MOMBASA are not included Customs Clearance Fee. Vehicle will be delivered to the specified location. If you are looking for car parts and garage in Dar es Salaam Tanzania. We recommend ALLWAN TRUST COMPANY LTD as a reliable company. It has been established by a Japanese company and they are supplying Japanese quality car parts and services. Other restrictions : Right Hand Drive. (Exceptions for specialised vehicles e.g. ambulance and fire engines), Vehicles over 8 years from manufacture year cost extra penalty.